If you already have Postgresql installed, you can skip this section. 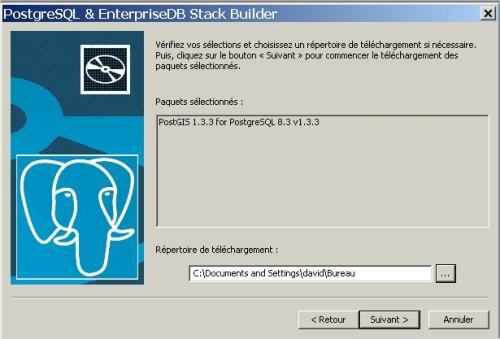 This section will guide you step by step to install Postgresql on Windows. 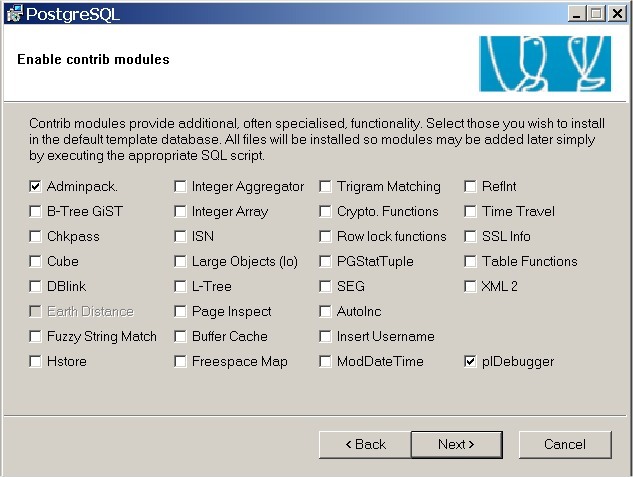 The next screen detailled the installation options and module. Let the default options and click "Next"
On Windows, Posgresql is seen as a service. 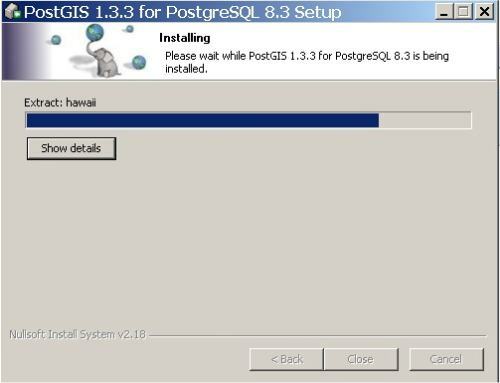 so it need a user account on the machine. The default user created is named 'postgres'. 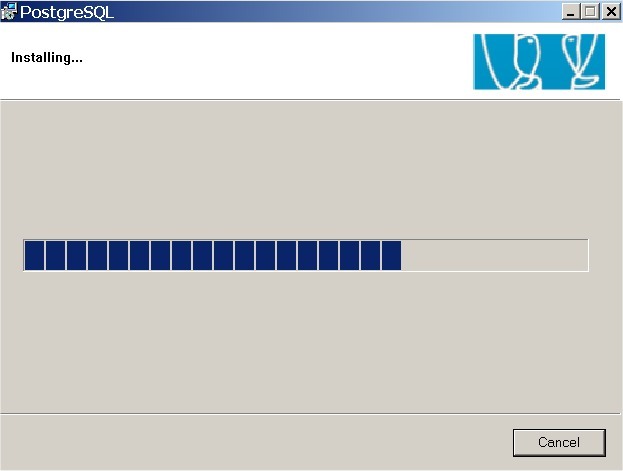 Enter the password twice and click "Next". 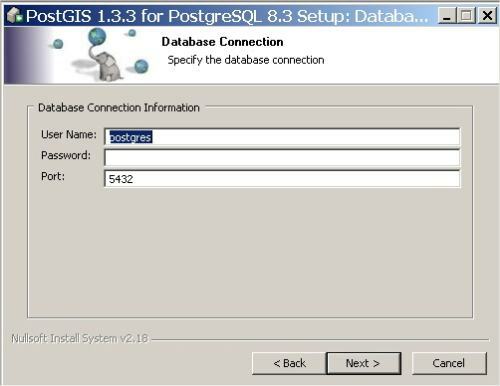 The password you give will not be the password of the PostgreSQL user 'postgres'. 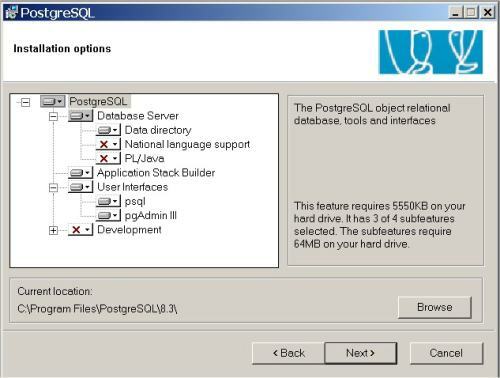 Now you have to choose the password for the the PostgreSQL user 'postgres'. 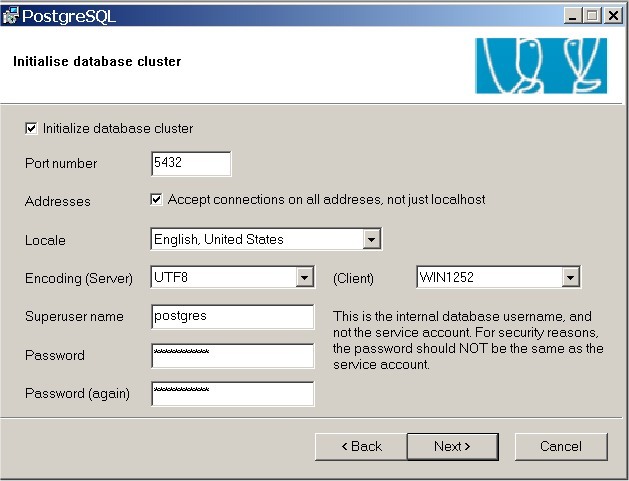 it is the database user with all rights. For this reason you have to remember the password because you'll need it to log in and create the database and tables. It is strongly recommended to put an other password than the windows account one. 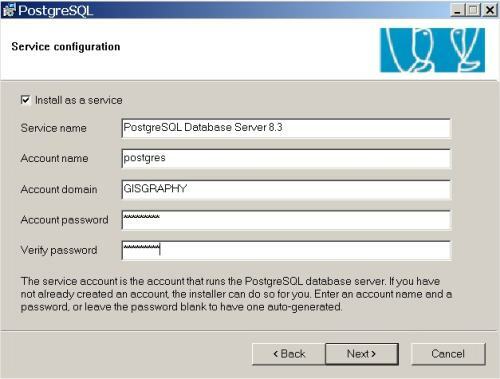 choose 'mdppostgres' if you want to use the default password defined in Gisgraphy. 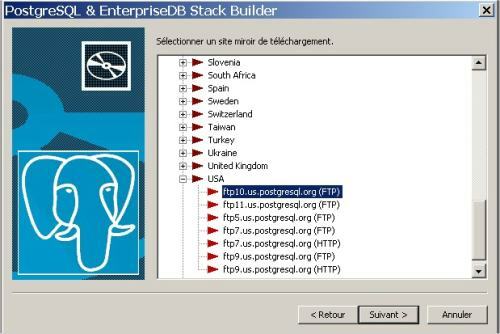 Click on "Accept connections on all adresses, not just localhost" (recommended, but not necessary if you will only use postgreSQL on the computer) choose your locale and choose 'UTF-8' for encoding (server)!! click "next". A message will prompt. It tells you that, due to the fact that you've checked Accept connections on all adresses, not just localhost" : the server will be reachable from other computers. Some procedural languages can be installed now or later, by default 'PL/pgsql' is checked. 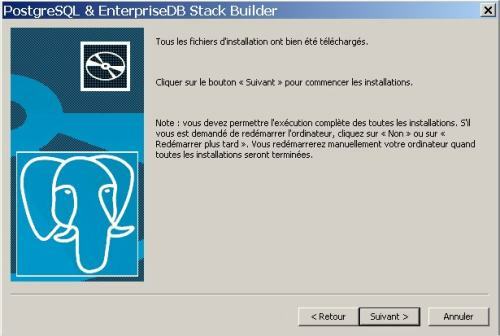 that mean that it will be installed. 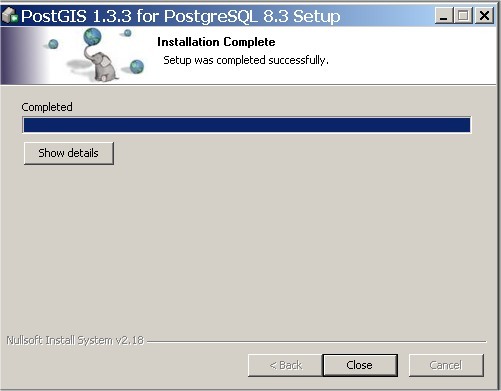 Keep the 'PL/pgsql' checked (it will be used by Postgis) and click "Next". Now you have to choose the contrib modules. 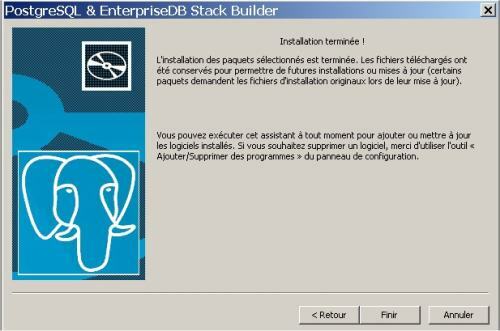 Keep 'Adminpack' and 'Debugger' and click "Next". 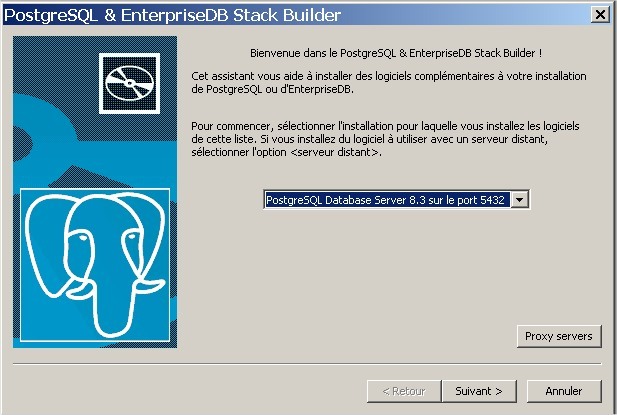 That's all we need, PostgreSQL is ready to be installed. Click "Next". You can see the installation progress. Here we are.PostgreSQL is installed ! Subscribe to pgsql-announce if you want to be informed of update and bug corrections. 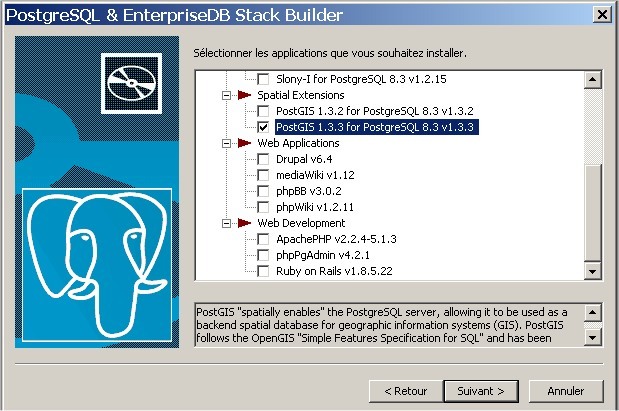 Keep 'launch stack builder on exit' checked and click on "finish"
We will guide you in the installation of PostGIS. Select your database server and click on "Next"
Check 'postgis X.Y.Z' and click "Next". Select a connection to download PostGIS and click "Next"
Keep The default destination folder where the installation files will be downloaded. 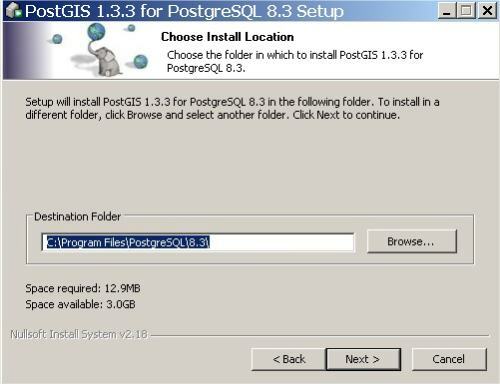 We need to download the PostGIS installation files, click "Next" : the files will be downloaded. 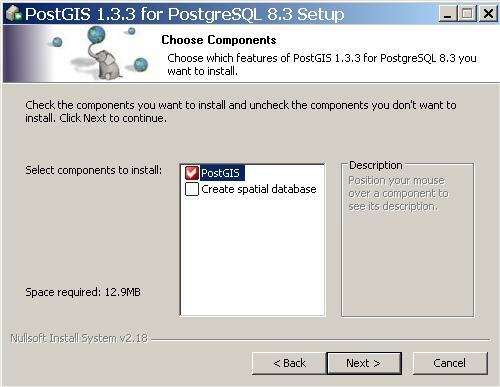 Unchecked 'create spatial database' (we don't need) and click "Next"
keep the default destination folder "C:\Program Files\PostgreSQL\X.Y\" and click "Next"
We need to enter the postgresql user password to initialize PostGIS (not the computer account one), keep the default port, and click "Next". 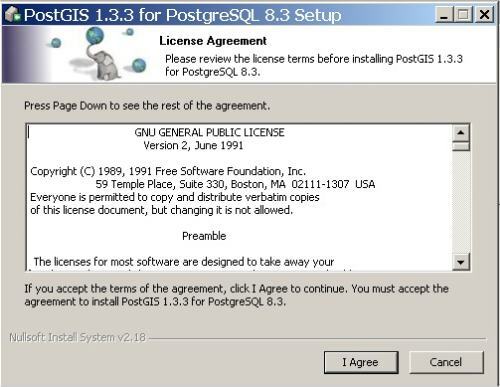 Tips : Install PGAdmin. It will be more user friendly than command line. psql -U YOURUSER  -h YOURIP -c  "CREATE DATABASE gisgraphy WITH TEMPLATE = Template_postgis ENCODING = 'UTF8';"